It has been an interesting year, blog-wise. I took this screenshot at about 9pm, December 31, 2011, (at +8GMT, in case you're reading this somewhere from the USA and wondering whether I'm living in the future) and it astounds me how much this blog has grown from when I first started it in 2009. To be fair, I was primarily blogging at tabulas from 2004 up until the middle of this year when I finally decided to move over permanently to blogspot. 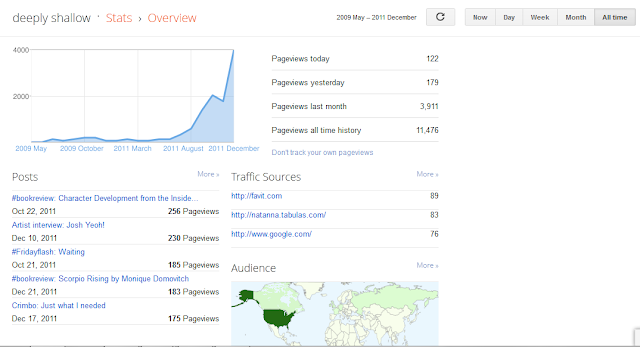 Still, 11K pageviews, approximately 1/3 of which was in December alone is astounding - for me. 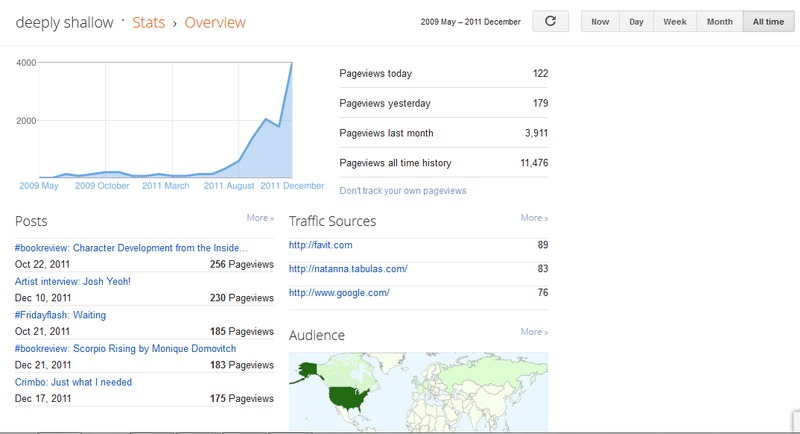 I guess for some of you out there with like a gazillion page views and thousands of comments, this is no big deal. But I'm mind-boggled, I really am. This never happened during my 8 years at tabulas. 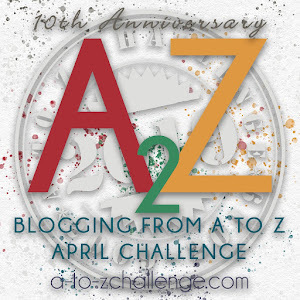 This annual blogging challenge is brought to you by Arlee Bird at Tossing It Out. I only found out about it at the end of March via Susanna (who's getting married next year, congrats!) and decided that since I didn't have time to do something as massive as Script Frenzy, I would try this out for a change. I managed to write a mini novelette consisting of 26 flash fictions (missed a few days, where I put up filler posts instead) over at tabulas, here. I might possibly (very high chance) do it again in 2012, though I'm not quite sure if I will do it in exactly the same format. We'll see. It was through this blogfest that I met the lovely Damyanti who has been an awesome blog friend, twitter buddy, and triberr head-chief. Do check out her book A to Z stories of life and death, which was written out of this blogging challenge. Over at Twitter, I've been following (rather sporadically, sometimes) the #fridayflash hashtag, which is where all these random tweeps link up their flash fiction. This is then compiled by J.M. Strother at the Friday Flash collector (or rather we help him to compile in our own links), and we visit each others blogs, have a nice dose of fiction on a Friday and leave comments. I'm pretty good at the reading part, but pretty bad at the commenting part. Sorry. I resolve to do better next year. Jumping back to meeting Damyanti, she invited me into this interesting twitter/blog thing called Triberr sometime in August. This is where you gather a bunch of bloggers with twitter, and you tweet out each others' blogposts as and when they come out. Damyanti did a post about it here (I'm too lazy to do a full write up about it now), but the main drift is this - since she hooked me in to our wonderful Triberr group called the Writer Warriors, I've gotten to know quite a few awesome writers, including one who was from Malaysia (Hi JC! ), who are all at different stages of their writing careers. I've also been finding great content via their sites, and getting traffic from the tweets they send out on my behalf too. So a HUGE thank you to all my wonderful triberr mates! I don't recall how I found out about this. It was probably some blog-surfing and/or twitter news that caught my attention, but this was pretty fun. Met quite a few new twitter friends and blog friends, and got some of my flash fiction compiled in a book. Check that out here. Co-hosted by Damyanti, Stu, Li and JC (are you getting a thread here?) this was a blogfest where we wrote 4 flash fiction in the same little town of Renaissance. That was pretty fun to write, and though I didn't win anything, it was a great read overall and found me new friends as well! So to summarise, what changed? In two words, mainly twitter, and Damyanti. This blog will still be pretty much focused on my writings, with my (hopefully) weekly #fridayflash (every Friday, DUH). I also intend to take part in several recurring blogfests, such as A to Z in April, Ren3 in May and the next writers' platform building campaign (probably have to skip the one in Feb - April, but hoping for the August round). After all, I had such a blast this year! One thing I hope to do in 2012 though, is to resume my fireplace series. Once upon a time, when I was part of a youth group called firebrands, I used to write a weekly devotional for my cell group members. It started off as a rather cut and paste thing (oh look, nice verse! Oh look, nice devotional off the internet! ), but this slowly evolved into stuff that I actually wrote. Part of the evolving meant that I wrote less often, but on deeper subjects. I graduated from the firebrands, went off to study, came home to work, and somewhere along the way, stopped writing fireplaces. And then I realised something - when I stopped writing, I stopped thinking. Because I mostly process things as I write, or deal with issues I'm struggling with via writing, when I stopped writing these devotionals (or even things that are vaguely spiritual), I found that I tended to stop really thinking about God. I reached a plateau. I stopped growing. So one thing I'm planning to do in 2012 is to keep a daily spiritual journal, and to make it really daily, I bought a diary with one day per page. No half pages for me, even on weekends. And to take you on that journey with me, I plan to resume writing these fireplaces, from that deep dark place in myself that needs to be processed. (You can cheer now, KK, I know you want to). It's 11pm now, and I'm going to toddle off to celebrate the new year with my family. Have a great one, where ever you are!